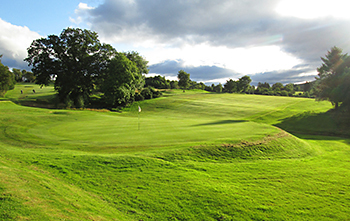 Instituted in 1893, Helensburgh Golf Club had a 9-hole course ready for its founding members within a couple of months of its formation, thanks to the efforts of Old Tom Morris, who set out the fairways on the site of the old Kirkmichael Farm, where he made full use of the natural features by incorporating trees, a quarry and an old stone wall into his design. By 1905, because the course had become so popular, long serving professional Tom Turnbull had added another nine holes, expanding the layout to a full 18-hole track. In September 1923, James Braid paid a visit when he advised on the repositioning of bunkers and the construction of two new holes at the 11th and 12th on the current course. The modern day layout extends to just under 6,000 yards from the back tees, playing to a par of 69, with only one par five on the scorecard at the 503-yard 13th, named “Lang Stracht”. A couple of short par fours on the front nine offer birdie opportunities at the 1st (“High Hopes”) and 5th (“Bunker Hill”). The back nine begins and ends with formidable par fours. The slope on the 440-yard 10th (“Clyde View”) favours a drive aimed to the right, allowing an approach to the green from near the middle of the fairway. And at the 400-yard 18th, the width on this hole is enough to encourage a full-blooded tee shot so don’t hold back on the final swing of the driver. The first three holes climb uphill, away from the clubhouse, before a farm track is crossed and the routing changes tack, heading east and downhill towards the 4th green. Like a lot of holes at Helensburgh, the fairway on the 4th dips significantly in front of the putting surface, requiring a rather precise approach shot. The short par four 5th veers uphill to the highest position on the course, where the turf underfoot is more moorland than parkland in nature, before the 6th then heads downhill and left into the corner, at the furthest point from the clubhouse. Holes 7 to 9 play down then across the hillside, with the short par three 9th demanding an all-carry te e shot across a ditch. So far, so good, the beautifully routed front nine is a joy but Helensburgh then steps up a gear, if anything. The 10th steers the course back downhill - with a couple of terrific fairway bunkers to be negotiated en route to the green - prior to tackling the two Braid holes on the course at holes 11 and 12. The first of these, the downhill par three drops dramatically towards the Clyde and it’s probably regarded as the “signature hole” for its panoramic views across the river but it’s the hole after it that really intrigued me, its fairway tapering sharply towards a gap in the woods, to a “hidden” greensite which only becomes apparent the closer you get to it, nestled snugly in the trees – for sure, “Dell” has to be one of the most fascinating short par fours in Scottish golf! Holes 13 to 15 are routed back and forward across the hillside, before the par three at the 16th calls for an heroic tee shot across a fern-filled gully to the sand-protected green on the other side. The last two holes march west towards the clubhouse, with the home green set well above the rolling fairway, allowing no easy finish to the round. After visiting Helensburgh, I can only think there must be real strength in depth within Dunbartonshire region when there are currently nine courses ranked above this one in the Top 10 chart for the county.